So it's been a crazy last couple of weeks - sorry for being so quiet. You know, the whole sprint to the end of the year at work thing. However, despite a manic work schedule and a pretty uneventful running schedule, major things have been happening in my running life. The title of this post basically sums up my news, but you're probably thinking, "wait I thought you said you weren't fast and I didn't see another marathon on your calendar so how could you have qualified?" Correct questions on both counts. However, something unexpected happened in New York when I ran the marathon last month: I met Katherine Switzer (more details on that HERE). Katherine has devoted her life to running and to helping women around the world. Her first historic Boston Marathon run has been the basis of her work and her charity - 261 Fearless. 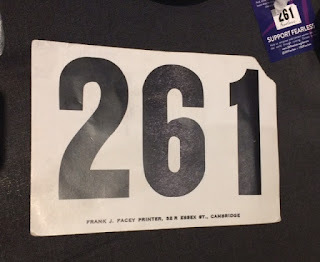 261 was her number when she was the first woman to register and run Boston 50 years ago. Doesn't that just sound wonderful? It's crazy to think about how far our sport has come, and especially how far it has come for women. Right now, the marathon is the only distance in which male still outnumber female participants. It has grown, become more inclusive, become more empowering, and I love everything about that. Running has given me so much over that years that I want to do everything I can to support others. Katherine keeps her bibs, too! At least this one! So when Katherine announced in New York that she was coming back to run Boston again in 2017 (50 years later) and that she was bringing a team to run with her, I signed right up to learn more. The minute I got home, I applied for the team. Let me tell you, it was an intense application process, but I get it. This is a race that most runners dream of running and the vast majority will never have the chance to do. 261 Fearless Values - is this awesome or what? And then I waited and waited and waited. Just when I thought all hope was lost, I got a call for an interview ... and then I was in. I was in the 121st running of the Boston Marathon with a champion of women's running supporting a charity I believe in to my core. It doesn't quite feel real - not quite like getting a BQ finish and registering - but I am terribly grateful and cannot imagine how I am lucky enough to get to be part of such a historic event. So here I go again, starting up marathon training. And not just any marathon, the BOSTON MARATHON! Yikes! So yes, this is how the last couple of my weeks have gone. As part of this, I am going to be raising money for this awesome charity. If you'd like to keep up with my fundraising progress, or if you'd like to make a tax-deductible donation, here is the link to my fundraising page. I'm linking up with two strong and fabulous and supportive women this week. Check out HoHo Runs and MissSippiPiddlin! Have you run the Boston Marathon? What charities/causes are you most passionate about? Wow this is great Lindsay, congrats! Thank you so much! I'm really excited! How awesome! I can't wait to hear about the training and everything! I ran Chicago for a charity, a few years ago. It was for Down Syndrome. Now that I have been diagnosed with RA, I would run for Cure Arthritis. In fact, I've applied to be an ambassador! It's nice to have a charity that has a personal meaning/connection. I ran Chicago the first time for Girls on the Run and I thought it made the experience even more meaningful. That is so exciting about the ambassadorship! I know you will be a fantastic voice for the cause! Wow! That's exciting! I'd love to run Boston someday,but (quite frankly) just do not have the desire to put in the work (and time) to have a slight chance of squeaking in a BQ and then the Russian Roulette of getting accepted in (because, as we all know, a BQ does not guarantee a bib LOL). I have considered running for a charity...but running Boston is not a priority...for now...(stay tuned). Good luck!! YIKES, this is totally awesome. So happy and proud for you. It is going to be so much fun hearing all the details as you get ready and then actually do it. Looking forward to your running exploits in 2017. Yikes AND awesome is right (and pretty much my exact reaction). Thank you so much! Here's to hoping my training goes a little better than New York - I think training in the winter will help. The extreme heat and humidity about killed me this past summer! Congratulations! This is fantastic news! I can't wait to follow along as you train for AND RUN the Boston Marathon. 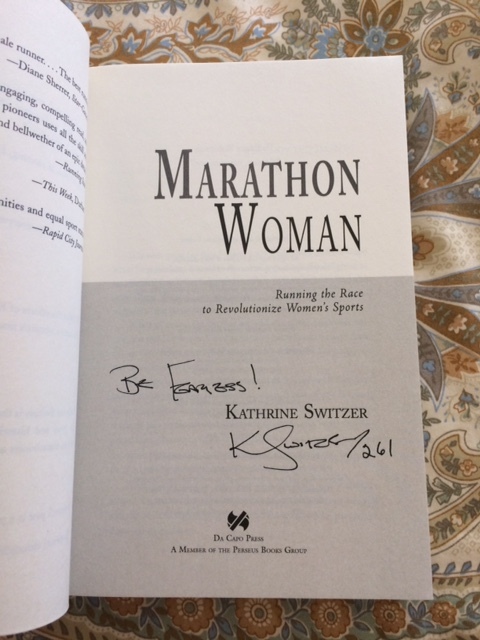 It's extra cool that you will be running it as part of Katherine Switzer's team. Thanks for linking, Lindsay! Thanks! I'm so excited! I just got off a conference call with her and some members of the team. Looks like she's planning to finish around 4:45-5 hours. I should be able to keep up with her :) Thanks for hosting!